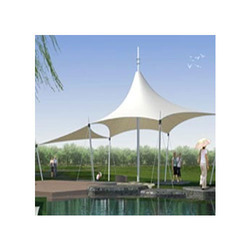 We are the leading service provider of Tensile Designing Services to our valuable clients. We provide our clients Tensile Designing Service. These eliminate many design and construction constraints encountered with traditional building methods. From fabric structures to modular designs and more complex products, we can turn out any shape, outline or size you want. Our expertise points us at the vanguard of tensile fabric architectural development and we will be delighted to advise you whether you plan to improve new or existing buildings with fabric cladding, to make over public spaces through creating a light, modern atmosphere or have any other requirement. Texsys Structures Pvt. Ltd. offers a full service to our clients from initial design concepts through to installation. We prefer to tailor our offer to your individual needs, whether you are an architect, engineer, builder or building owner. Texsys Structures Pvt. Ltd. provide a scope to ensure the successful execution of your project. Custom fitting design can be undertaken to ensure a perfect fit and structural analysis provided when necessary. We can work alongside your consultants or take on the whole scope of the project through to delivery. We provide assistance from the beginning of your project and can provide tensile concepts and advice on system selection.